The Middle East and North Africa Regional Director of the United Nations Children’s Emergency Fund called for “unhindered humanitarian access” to Aleppo in a statement released Tuesday, saying that UNICEF was “extremely concerned” about the conditions for children in the besieged Syrian city. Director Saad Houry asked parties involved in the Syrian war to protect civilians and children, reiterating previous requests that have been ignored. Aleppo, once Syria’s most populated city, now holds 300,000 people, including approximately 100,000 children. The UN’s statement about the conditions in Aleppo follows the suspected use of chlorine gas on the town of Saraqeb in Idlib Governorate on Monday night. Rescuers from the Syria Civil Defence, an organization that provides humanitarian aid within the country, said a helicopter dropped barrels holding toxic gas on the town, affecting 33 people, primarily women and children. Opposition forces laid responsibility for the attack on President Bashar al-Assad’s forces. Later on Tuesday, Syrian state news agency SANA returned the accusation of chemical weapon use, reporting that rebels launched gas-filled rockets on a government-held area of Aleppo, killing five people and causing breathing difficulties for others. Both the government and rebels have been accused previously of deploying chemical weapons — a violation of the Geneva Protocol — but have denied the charges. On Monday, the Russian defense ministry said one of their military transport helicopters had been shot down by rebels near Saraqeb while returning from Aleppo to a Russian air base in Syria. Since mid-July, when Syrian government forces gained control of the only road leading to rebel-held areas of Aleppo, supplies have dwindled, with aid unable to reach the city’s isolated residents. Aerial attacks have recently rained down on the remaining medical facilities in the area, further inhibiting efforts to effectively treat injured individuals. Russian airstrikes have continuously hit Aleppo and surrounding regions in recent months, as troops loyal to the government of Assad seek to regain control of the city, a strategic strongpoint. 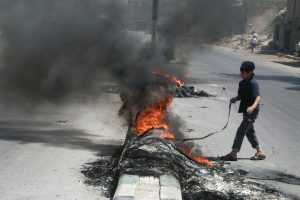 Fighters and residents inside the besieged city, including children, recently began burning tires in an attempt to hinder aerial attacks as they launched a fierce offensive against government forces.